Thirty-Six of Shakespeare's plays are printed in the first folioA book made by folding large sheets of paper once, creating two leaves or four pages.. Two additional plays that do not appear in the first folio, Pericles Prince of Tyre and The Two Noble Kinsmen, are now considered to have been written at least in part by Shakespeare. Two other plays, Cardenio and Love's Labor's Won, are mentioned in documents during or shortly after Shakespeare's life as having been written by him, but they have never been found. Eighteen of the first folio plays had never appeared in print before. Since they had not been previously published, they might have been lost forever. See Publication History for quartoA book made by folding large sheets of paper twice, creating four leaves or eight pages and octavoA book made by folding large sheets of paper three times, creating eight leaves or sixteen pages editions that were printed prior to the first folio. 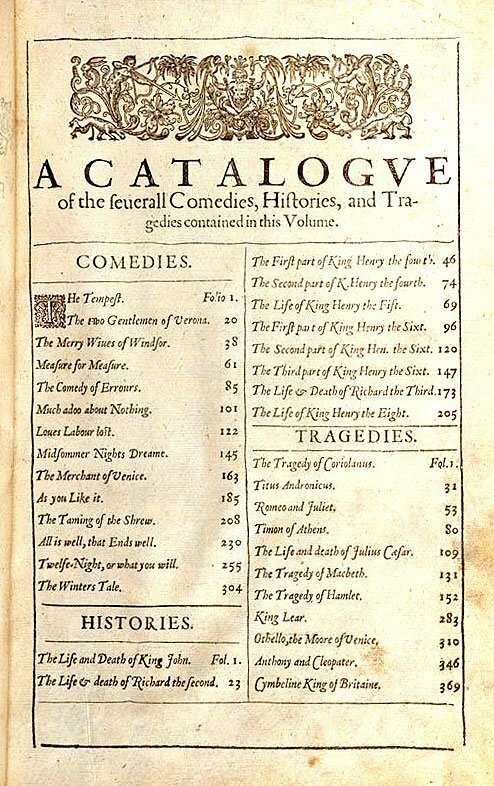 The first folio categorized Shakespeare's plays into three genre. While we still recognize the Greek masks of comedy and tragedy, the Folio established that Shakespeare was instrumental in creating a new genre, history. Future scholars recategorized some of Shakespeare's plays as romances (sometimes called tragicomedies) and problem plays. They are darker than his comedies but not quite so mortal as his tragedies. Romances incorporate theatrical spectacle as well as mystical elements. Problem plays explore more complex psychological and moral issues. These definitions are not settled among scholars nor do scholars agree about which plays belong in each category. Bold — works that appeared for the first time in the 1623 first folio. *Single asterisks — works later recategorized as Romances. **Double asterisks — works later recategorized as Problem Plays. Works below in Italics were published during Shakespeare's life in quarto editionsA book made by folding large sheets of paper twice, creating four leaves or eight pages. but did not appear in the First Folio.